Nothing feels like living in the future than telling a robotic vacuum to clean your carpet. While not particularly complicated, saying 'Alexa, tell Roomba to clean the room' — and hearing the motors whirr to life — is quite pleasing. But this little luxury doesn't come cheap. A Roomba can cost up to $900 for a taste of the future. Want to add voice control? That will cost another $49 for the Amazon Echo Dot or the Google Home Mini. The Roomba 980 is priced three times as much as iRobot's cheapest offering, the $300 Roomba 650. Is it worth all that cash? We invited the robotic sweeper into our home to find out. The 980 looks broadly the same as all other Roombas. This means the robot cleaner is a circular device, around three inches tall with the diameter of a large pizza. 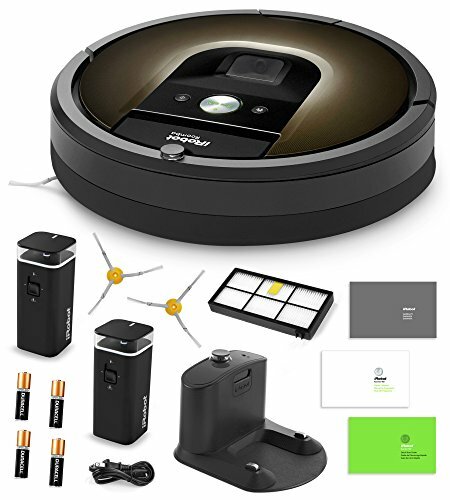 Flip the Roomba over and you will find two wheels with grippy rubber tires, two rollers designed to feed dust and dirt into the collection system, a downwards-facing sensor to stop it falling down the stairs, and a rotating brush designed to flick dirt out of corners and into its path. The dust bin sits at the back, occupying around a third of the Roomba's total footprint. This piece slides off easily, opens to deposit dirt into your bin — and is also where you gain easy access to the filter, which is simple to clean. The 980 comes with one spare filter and one spare rotating brush. The bin, filter, full bin sensor, front caster wheel, rotating brush, sensors and battery can all easily be removed for cleaning and replacement when necessary. Turn the Roomba back onto its wheels and you will find a convenient handle for picking it up, plus three buttons — one for power and to start and stop cleaning, one to tell the Roomba to go back to its charging station, and one for 'spot cleaning', where the Roomba will intensively clean one specific area. Using the Roomba is remarkably simple. If you don't care for the smartphone app, or require scheduling or Alexa or Google Home support, it's simply a case of plugging the charging station into a wall outlet, placing the Roomba on that, waiting for it to charge then pressing the big button marked 'Clean'. The Roomba then gets to work, roaming the room and cleaning up dust and dirt. Its movements are quite random on its first couple of cleans, but rest assured — the device knows what it is doing. The Roomba is building a map of your room and learns the best route after multiple uses. The Roomba also seems quite clumsy at first, bashing (gently) into everything: but this is how it is designed to work. The cleaner won't cause any damage unless you have a habit of leaving wine glasses on the floor. Areas with more dirt are recognized by the Roomba and cleaned more thoroughly; the suction power is increased and if required the robot will move over an area several times to make sure everything is picked up. The device uses a camera to spot which areas are the dirtiest. When driving across clean floors the Roomba will reduce suction power to save battery life, before turning everything up again at the next bit of dirt. In a nutshell, this is the Roomba experience. But to stop here would be to do the 980 a disservice. Wi-Fi and a smartphone app means it can do much more. 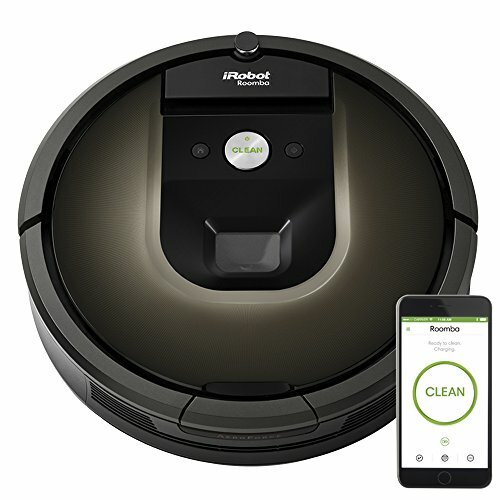 Download and install the iRobot app on your Android or iPhone, give the Roomba a name (yes, really), follow the simple instructions for connecting it to your Wi-Fi network and you're ready to go. The app lets you connect to the Roomba remotely — to ask it to clean up while you are at work, for example — and receive notifications about when it has finished its job, or when the bin is full. There is also a scheduling system to set when the Roomba should clean on each day of the week. A daily clean will be particularly useful for pet owners, while setting the robot to clean up once or twice a week while you're at work will probably be enough for the rest of us. Want to see how Roomba's doing? You can pull up a history page full of stats: how much floor space your Roomba has cleaned in its lifetime, and also how long each cleaning job lasted. The settings page lets you control features like 'carpet boost', which increases suction power over carpet, and 'edge clean' which is where the Roomba seeks out walls and cleans thoroughly along them. Finally, the Roomba can be set to pass over the floor once, twice, or as often as the device sees fit. A recent software update for all Wi-Fi enabled Roombas — that's from the 690 upwards — lets you control them via Amazon Alexa and Google Assistant. Link your iRobot account with either assistant (or both, if you so wish) and you can ask them to clean up with voice instructions. It isn't quite as seamless as "Alexa, clean the kitchen floor" or "Hey Google, start cleaning" because you have to ask the assistant to tell Roomba. So the commands are "Alexa, tell Roomba to start cleaning" and "Okay Google, tell Roomba to go home [recharge]". Despite this slightly clumsiness, having your carpets cleaned with a voice command feels like the future. First and foremost, the Roomba 980 is a very good vacuum cleaner. It is powerful and does a great job of cleaning both carpets and hard floors. This is important, clearly, because iRobot wants its customers to replace their conventional vacuum with a Roomba. In most use cases this is entirely possible, but not all. Roomba cannot, for example, tackle stairs. If yours are carpeted, you'll need a second vacuum for those. The vacuum also struggles to clean thoroughly in the small crevice between carpet and skirting board, but then this is the case with most regular vacuum cleaners too. Roomba will definitely not fall down the stairs, you'll be pleased to know, thanks to its cliff sensor. It will drive slightly over the edge, before stopping abruptly, then work along the edge of the drop. Don't want Roomba to enter a specific room? You can also use 'virtual wall barriers' to stop the Roomba from going into a space. Place a virtual barrier next to the dog's water and food bowls, for example, and the Roomba will keep at least 4ft away. Two virtual barriers and the required AA batteries are included in the box. The iRobot Roomba 980 doesn't justify its extra cost just because of Wi-Fi and smart home integration — you're also paying more because this model is a full ten times stronger than Roomba 614 and 690, and five times stronger than Roomba 890 and 960. You're paying more for deeper cleaning. Despite its inability to tackle the stairs, we found living with a Roomba is likely to leave you with a cleaner and tidier home. We set the Roomba to work every other day while we were working, and during every session it would clean under the sofas and beds, reaching places that, if we're being honest, would be missed if we do the job ourselves. Living with a Roomba also made our home tidier because we didn't want to leave anything this feisty device might try and consume. We picked up wires from the floor and put them away. Stray shoes? We moved those too, as well as furniture, positioning pieces to give the Roomba space to navigate. That's not to say the cleaner can't fit through small spaces — because it really can. Sometimes the vacuum's ability to squeeze in-between furniture and under tables pleasantly surprised us. The Roomba 980 is smart too. Our living room is set up in a way where two sofas are very close to each other, with just enough space between them to squeeze through to a makeshift home office. The Roomba cannot fit through that gap. But the cleaner discovered it could go under one sofa, into the office space, then back under the sofa to return to its charger. Speaking of recharging, the 960 and flagship 980 are the only models of Roomba which can carry on with a cleaning job after recharging. However, you're likely to find its bin gets full long before the battery winds down, which in the 980, is about two hours. We found the bin needed emptying after around 40 minutes. But if we set the Roomba to clean every day (and therefore pick up less dirt) then this could be extended. Through the app you can set the Roomba to continue despite its bin being full — but be aware you may come home to find a mess when it comes to emptying the cleaner. You can also tell the vacuum to stop, drive back to its starting point and wait to be emptied — and then send a notification to your phone. While the Roomba does a thorough job when left to its own devices, sometimes you'll need it to clean in one specific area. For this there is 'spot mode', which is activated by pressing a button on the top of the device. This cleaning mode tells the Roomba to use maximum power to clean in a spiral moving outward at first, from a starting point to a radius of three feet — and then inwards again. We love the Roomba 980. But we wonder if our love is of the flagship 980 itself — or of just having a robotic vacuum cleaner. We'll soon be trying out a cheaper Roomba to test that theory, but for now we can say — if you have the money — the 980 does everything you could ask a robotic vacuum cleaner to do. The cleaner is powerful, intelligent and easy to use. The device also encourages you to keep your house tidy and actually makes cleaning fun. Our carpet is in great condition every day thanks to the genuine joy we get from letting the Roomba do its thing. Yes, this is probably just the honeymoon period, and eventually it will become part of the furniture and a house chore like any other. But where other smart home gadgets, like lights, locks and thermostats, feel sterile and utilitarian, the Roomba — with its name, its apparent intelligence and the triumphant tune it plays when completing a clean — feels almost like part of the family. Pros: Very simple to use, powerful cleaning and good smart home integration. Con: This model is expensive, the app won't be needed by everyone, and it can't do the stairs.